Steve says, “getting a puppy is an exciting time, but I find when I ask people a couple of questions, their lack of planning really shines out. Q: What are your short, mid and long term goals for this puppy? Most common answer: Long term goal Australian Champion! ahhh, short term goals.. ahhh toilet training? Here we have some great options for new puppy owners. This is not a puppy school where you may get good results, average results, no results or bad results, (see this article), but instead it is a step by step guide designed to teach you how to develop your puppy into the adult dog you have dreamed of. Perhaps you think that your just looking for a well mannered “pet” and it isn’t neccessary to go to this detail. Wrong, Steve’s Behaviour Consults are most often dogs that are just “pets” but are behaving badly. Perhaps you are aiming more at a dog to be the next Obedience Champion? Well thats fine too because Steve coaches some of the best Obedience Competitors in this country, (yes we have video) and starting the right way is directly proportional to your overall success. This course asks you to complete a detailed form describing yoiur level of experience and what goals you have for the puppy, and the lectures and lessons are then chosen to help you achieve these goals. Steve will guide you through the systems he uses to teach, train and manage puppies in his incredibly popular system. In your lessons, you will be taught and shown how to teach and train your puppy effectively using only the best motivational systems developed by Steve. Enjoy the expertise of not one but two course trainers to help guide you through the programs and lectures. You will receive detailed written programs that will include video and or diagrams of how you need to practice your sessions at home. We will help you expose your puppy to varying social situations and coach you how to create a confident, motivated and well balanced pup. This course includes 12 hours individual attention delivered by two trainers, accompained by detailed reading material with 8 weeks after course email support! This is a private training course just for you and your puppy, no group to get lost in. Feeling nervous about getting it right? this is the best option for you because we will be right there with you 6 of the most important weeks of your puppies life. Understand this is you getting something for you, an investment in yourself and this investment will keep giving you returns the rest of your life! Perhaps you haver had a puppy before and you would like to brush up on the best concepts and training methods that are currently available. 5 hours with Steve over 2 sessions spread 4 – 8 week apart will give you access to the right development programs and be shown how to implement them. Included is a follow up 2 hour session just to make sure your on the right track and make sure nothing is going in the wrong direction. First session is a 3 hour jam packed session with useful practical and easy to complete exercises that will help you raise a balanced and motivated puppy. Both session include theory and practical information and plenty of time to ask any questions you may have. You will receive detailed written programs that will include video and or diagrams of how you need to practice your exercises. Receive 8 weeks email support directly from Steve. Many people will find this course invaluable and exactly what they need to update their knowledge and get great results. A 6 week course aimed at dog Breeders puppy buyers. If your a breeder, we understand the concerns you have when people take your puppies home, and to add to those concerns we have all sent a puppy to a home where the new owners have sought help and guidance from people you wish they hadn’t. Quite often, breeders of active breeds like German Shepherds, Rotweillers, Malinois, Doberman and many other breeds will recieve feedback from new owners who are concerned as the person who runs the puppy school has said their puppy is aggressive. Well compared to perhaps a Cavalier King Charles Spaniel they are, but the behaviour of the pup may be totally normal for that breed. As a professional breeder Steve recognises this most of all and we understand different breeds have different traits, and that is ok! This course is is available to breeders, you will purchase places in our puppy school on behalf of the new owner. You can recoup the funds from the puppy owner or include it in the price of the pup. 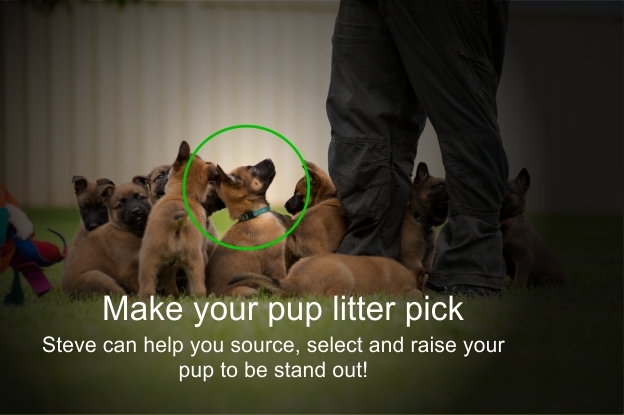 The only pups in the class will be the pups from your litter. The class will be designed specifically for your breeding and as a breeder you are also welcome to have input on course content and attend yourself! Class usually needs a minimum of 4 puppies to run but if you have less than that, we can discuss options for you. New owners are taught all the neccessary aspects of feeding, vaccination, socialisation, management, obedience etc. An excellent way to be 100% sure that the information your puppy owners recieve is suitable for your breed and accurate. We believe these are the best options available and when you attend, you will too.